Yesterday I was privileged to enter into the world of speech therapy. 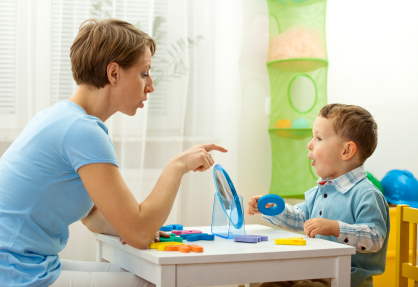 Of course, I refer to speech therapy often for kids with language disorders and/or articulation disorders, and of course, in my training we worked with many highly trained speech therapists, but yesterday, I had a refresher course on the wonders of these professionals. Little children, ages three to five, were playing in the waiting room and then so excited to meet with their speech therapist. Moms or dads waited, most seeming to text with friends and family, while their child was in their appointment. Then, the therapist came out with a happy child, and the parent took the child off to their next activity. Then, after I observed the children and parents in the waiting room, I was invited back into the suite. There, I met with six speech therapists and saw their work space. We all sat down at a conference table and we reviewed our work. I explained to them my views of child psychiatry and how much I would like to see child psychiatrists continue to get on the floor with children. They explained to me that the children they see really benefit from their work, but that parents are particularly stressed with all of the activities that their children are involved in and this trickles down to make the children anxious. It was their observation that more kids are anxious now, compared to ten years ago. We talked about the economy, the difficulties of living in Los Angeles, particularly the traffic and the limited school options. We all agreed that as professionals who work with children, there is not enough cross-pollination such that we do not have a good idea about what our collaborators are doing to help our patients. We also patted our own backs for taking a first step in bringing child psychiatry and speech pathology in closer contact, simply by our meeting together. Our work is complimentary. Kids need language intervention to learn at school and to make friends. Kids also need child psychiatrists to help them cope with anxiety and maximize their psychological potential. As with so many things, the more we can hold each other’s hands, like kids on a play yard, the more we can assure parents that we provide a network of resources for their child. This network is vital to promote healthy development. Once again, a simple concept, easily forgotten.